Assertiveness requires strong body language and clear communication. Being assertive lets you express your own needs and desires without trampling over those of others. It means articulating and standing firm in your convictions without resorting to belligerent or manipulative behavior. It can be a difficult habit to master, in part because it depends on developing patience, self-respect, empathy, good listening habits and clear communication. But the benefits are tremendous. 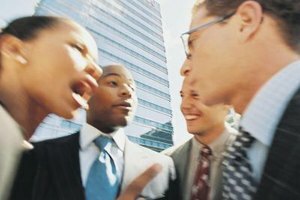 Assertive people are confident in who they are while being respectful of others. They express their needs, but not at the expense of others. This allows them to make mutually satisfying compromises rather than giving in to the other person or demanding their own way. We acquire assertiveness through developing a positive and realistic self-image. While acknowledging our limitations, we don’t obsess over our mistakes. We celebrate our strengths as individuals. We recognize the good that we bring to the world. Then, when situations arise that we have the power to influence, we feel confident that we can offer constructive solutions. Often relationships run more smoothly when we tell others directly what we’re feeling instead of just hinting or hoping they figure it out. Be willing to let others know when you’re not interested, when you don’t like an idea, when you have a more constructive solution. Practice making “I” statements -- “I feel this way,” or, “I don’t have a good feeling about this,” with a trusted friend. Practice saying “No” when the other person makes requests you don’t want to fulfill. Throughout the rehearsals, ask your friend for honest feedback and continue to rehearse until you feel confident in what you need to say and how you want to say it.